From her very first touch of the piano keys, Madilla feels a strange tingle of energy running through her fingers. In defiance of the customs of her people, she connects through the spirit of her music with a wild mountain sparrow that shows her the freedom of wings and an endless blue sky. 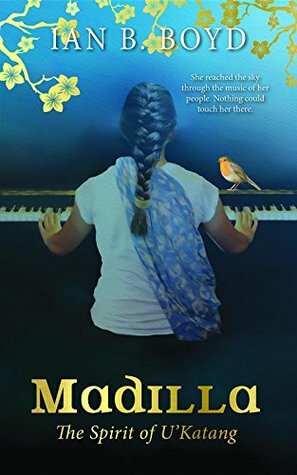 Her piano becomes Madilla's only escape from the violent atrocities of an isolated and forgotten mountain village, poisoned by centuries of military occupation. But her family has no escape. Tormented by lust and hatred, her uncle succumbs to the ways of the soldiers, igniting an even greater evil lurking within his spirit. Recognising the confusion of her Mama's unshakable beliefs, Madilla searches for her own truth. What she learns is that the magic she feels through her piano is only the beginning. Madilla is an intriguing book that straddles the worlds of literary fiction and fantasy. Even now, I'm unsure into which of the two categories I would place it. The author sent me a copy of this book as a thank you when I featured him in my interview series, so I came to it not knowing what to expect. In the end, I enjoyed it. The world building was beautifully done--I got a real sense of the culture in which Madilla lives--and the characters were engaging. It also kept me guessing about the ending right up to the last few chapters. I would recommend this book to those who like a hint of fantasy in their literary fiction, or, indeed, vice versa!